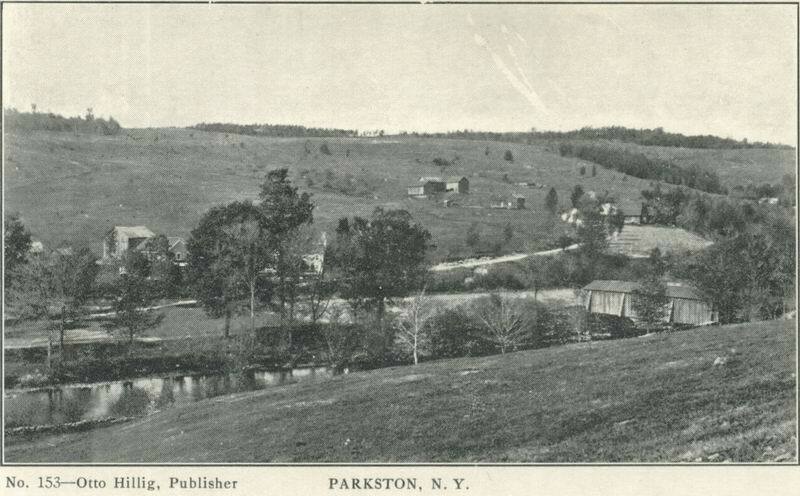 Parkston NY - The earliest information about Parkston is in 1865 when P.H. 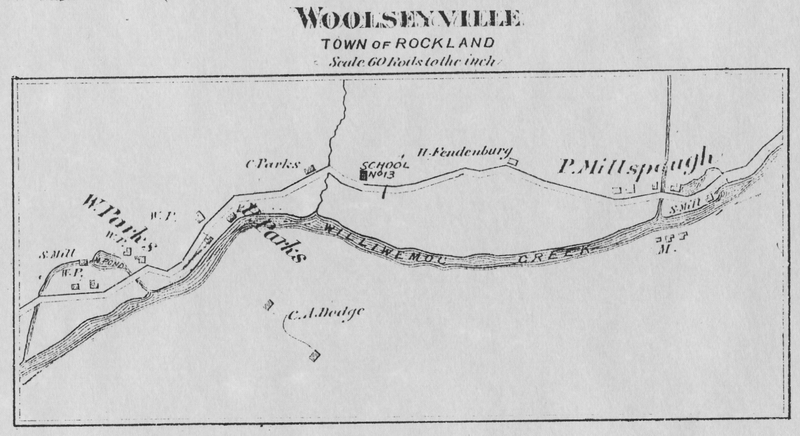 Woolsey and Henry Lowe contracted with William Parks to cut lumber. 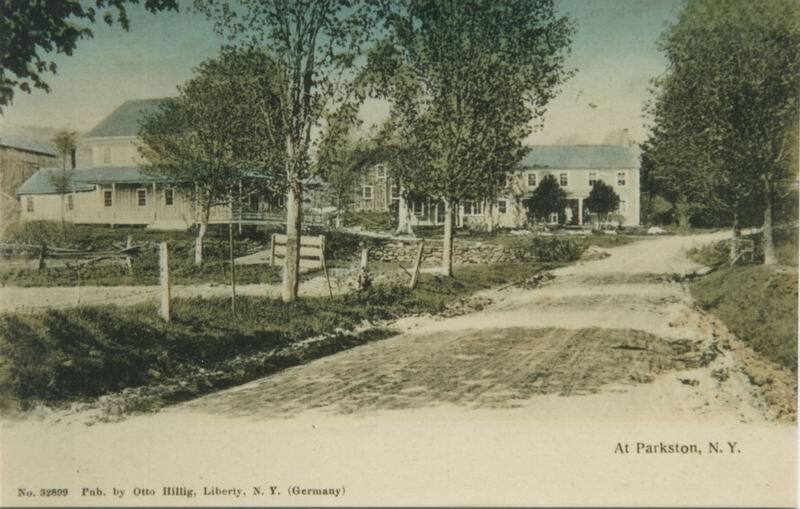 William Parks owned several hundred acres in Parkston including the Barnhart/Lacey farm and the Hotel Capitol lot. He had built a sawmill and pond that later became the pond for Hotel Capitol. The Beers 1875 map shows William Parks sawmill and houses in most of Parkston. The next lot is the brother Peter Parks lot that later became the Hotel Lorraine Hotel. The next lot was brother Cornelius Parks. Note the two buildings to the right of the smaller pond above the sawmill. It is suspected that William lived in these house and barn and his father Joseph lived in what became the Barnhart/Lacey house. 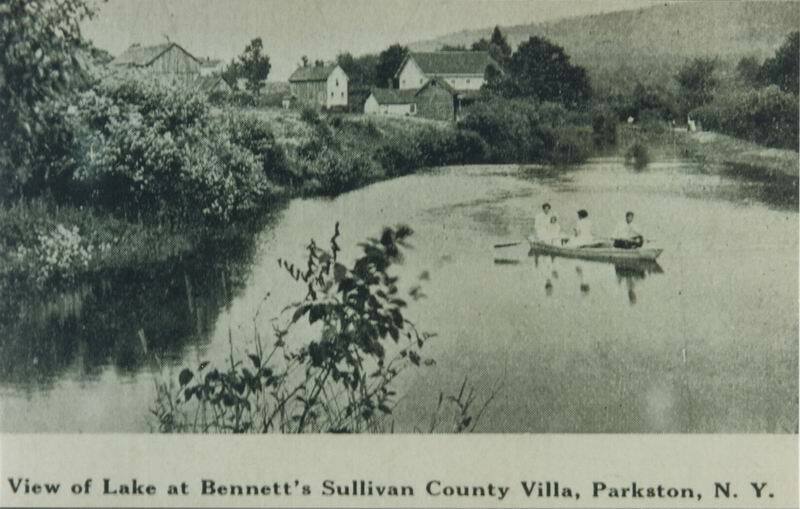 This picture shows the houses, barn and ice houses just above the sawmill pond where the boat docks were for the Hotel Capitol. The DeBruce road can be seen in the distance by the inlet for the pond. Note the small building in the center with the 3 windows and the large 2-story building to the right that was probably the Bennett's Villa (probably bought from William Parks estate after 1891). This overview of Parkston shows the covered bridge and in the left center the two buildings above the pond on the 1875 beers map and on the Bennett postcard. A third building can be seen through the trees. This building sits right next to the raceway for the pond. 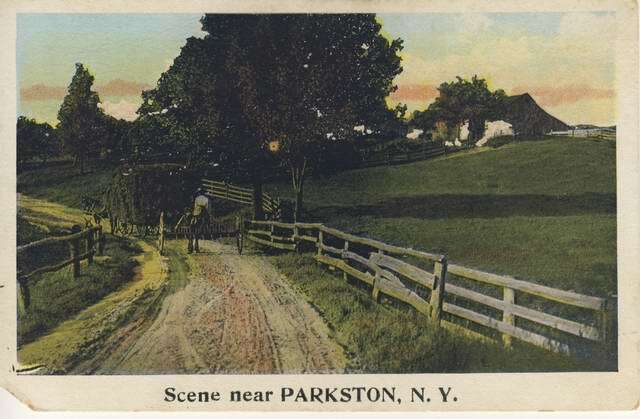 The Peter Parks house and farm are in the center of the picture with the barn that was still standing when I was a kid is. The building on the far right is the Cornelius Parks house. A view up the DeBruce road shows the new house on the left next to the raceway and the other buildinigs on the right. Note the building with the 3 windows that shows up in earlier pictures. The picture was labeled the Parkston PO but was taken in front of the Parkston Post Office that was occupied by the George Barnhart family after William Parks died. Scene near PARKSTON - Anybody have an idea where this picture could have been taken near Parkston. Based on the shadows the hay wagon and rake was traveling West which could be the DeBruce road towards Livingston Manor.